Media project’s black wall, with Amirali Ghasemi one of the curators of the International Roaming Biennial of Tehran and we will try to connect on Skype with Serhat Koksal and few other organizers of the Biennial. 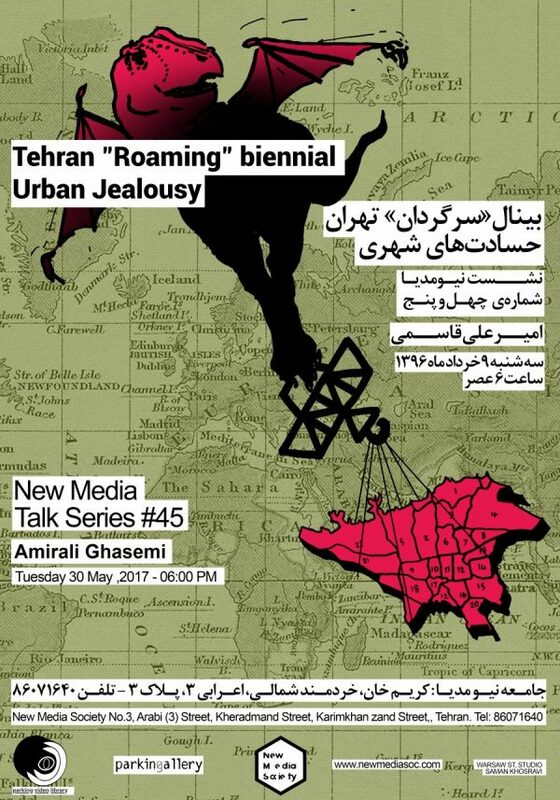 9 years ago, the International Roaming Biennial of Tehran, started under the theme of Urban Jealousy, when Tehran still did not have a proper biennial, by borrowing a concept which barely existed beyond a faded history from 50 years ago and yet was far from imagination to become a reality. The project defined itself as a roaming biennial, which although bears the name of Tehran, never visited the city, on the contrary, it set for different destinations such as Istanbul, Berlin, and Belgrade.Furthers stops like, Rotterdam, Berlin, Beirut and Gdansk never realized due to complications after 2009 elections that shifted the context of representing such project completely. Urban jealousy in Istanbul focused on the process of biennialisation and the competition between developing cities to mark themselves on the map as a cultural tourism destination. In Berlin, Urban Jealousy by choosing specific venues and location tried to investigate the relation between The gentrification and artistic behaviors in the context of Berlin and finally in Belgrade chose the public vs private as its core concept. Amirali Ghasemi (1980- Tehran) Is a researcher and self-thought curator based between Tehran and Berlin. Founder of Parkingallery Projects and curator/co-founder of New Media Society has backgrounds in Graphics, Poetry, photography and Moving Images and has curated a large number of international projects in Iran and abroad since 2003. He has recently joined the Art in Context Institute, at the university of Arts Berlin.